In the past, I gave away frozen sperm vials that I had stored at a sperm bank, to a few women desiring to get pregnant by artificial insemination with donor sperm. My sperm bank could ship the sperm vials to most places in the USA. I helped women of many races. I did medical tests, including AIDS, with a 6 month quarantine, to try to minimize risks, and also because mandated by law. I signed a "known-donor" agreement which allowed children conceived to meet me if they chose, once turning 18. I also helped with a few IVF cycles (including providing sperm and sharing costs) and even did a few cycles involving a surrogate mother and egg donor (again I helped pay the costs). About me (the sperm donor): I am Caucasian, 6ft tall, with black hair, fair skin, 170lbs. I am fertile - I already have 4 healthy children. I am leader of a small research group in a medium sized computer software company. I hold more than 10 patents for various inventions, I hold an advanced university degree from one of the world's top science universities, I got straight A average in my university courses. I won various awards for competitive sports while in high school. 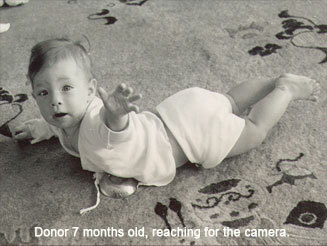 To see photos of me (the sperm donor) as a child, click here or click on the pictures above. To find out more about me (the sperm donor), click here. williamn@alumni.caltech.edu is my email address. People I have helped or their offspring, or anybody else who has questions or comments should feel free to contact me.